6 hours of driving, or about 180 kilometres away from Belem, the fishing village of Algodoal is the region’s favourite beach and island getaway. It’s an absolute treasure. There are no vehicles on the island; and even though electricity has been introduced, the paths aren’t lit up at night, so the character of the islands can be better preserved. One of Brazil’s most beautiful beaches can be found here – the Princess beach, 14 kilometres of clean sand and blue waters. 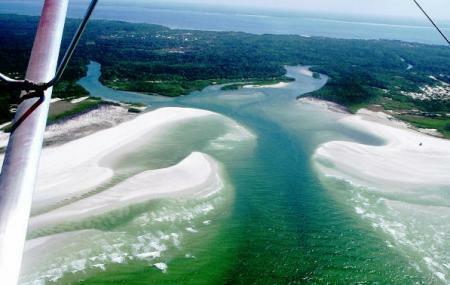 There is a mangrove region in the centre of the island. Several small cafes are scattered around, and there are lodges where you can spend the night. If you really want to explore though, ask the locals to arrange for you to be shown around. During the summer month’s the island is quite crowded, but in downtime, it’s empty, save for the locals. Hard to say which time is the better time to visit. You may have to carry luggage a good distance to the lodge, so travel light. The Carimbo is performed on Saturdays. Recommended time to visit this attraction is 24 hours. Take bus from Belem to Marudá harbour. From there, take Popopo boat for a 40 minute journey to the island. How popular is Algodoal Island? People normally also visit Vila Do Algodoal Beach while planning their trip to Algodoal Island.